We even joked what the over/under would be on new riding pics and video…but it seems like the old adage of “once a rider, always a rider” is holding true. Jim dropped some serious heat on his Instagram this past weekend…with a bunch of awesome riding pics and clips from WNY Jam. Awesome to see the OG back at it again! What’s the over/under on more Jim C pics? If you’re a betting man and you’re wagering that you’re going to see some more Jim Cielencki pool riding pics…you’re in luck! Jim C’s “active retirement” continues with some over/under action with jon_bad ! Scott Balzer is the man behind the camera for these shots. Looks like a super fun session. I’m pretty stoked on these pics. Can a full-blown edit be far behind? If Jim’s “retirement” continues at this pace, I wouldn’t be surprised! Jim Cielencki’s “retirement” from riding seems to have gone off (or into) the deep end as of late. In a bit of an unexpected surprise, Jim C has dived back into riding (at least for the moment) to session a local pool that’s scheduled to get filled in soon. He’s been documenting those sessions on his Instagram account. And based on the comments there, I’m not the only one stoked to see Jim C out riding again. And even though it’s only the third time this year out on his bike…according to Jim this is “the highest [he’s] aired in this pool”. Good to see Jim C back on the bike! Hard to believe this clip was put out way back in ’09. I’m still pretty stoked on it though. Jim Cielencki with an over-crankslide on the OG Sunday Model-C.
Jim Cielencki, one of the BMX world’s most creative and influential riders has been keeping a bit of a low profile since saying “see ya” to Sunday Bikes (back in 2014). Of course, his legacy in 24″ BMX lives on in the ground-breaking Sunday Model-C and the progressive 24″ riding he helped champion. Jim was always out there seeing what was possible. Now, Jim’s taking that same sort of thinking to his current passion, running. Rather than run the same training route everyday, Jim has taken it upon himself to run every street in Buffalo, NY. Not only that, he’s documenting all the cool things he encounters along the way in an addictive (to me anyway) Instagram account called Mile by Mile: Buffalo. It’s pretty cool to see Jim’s creative instinct being expressed in an entirely new way. Bonus info: It’s Jim’s birthday today! Happy Birthday Jim! Jim Cielencki announced today that he is stepping away from Sunday Bikes after 9 years. One of the BMX world’s most creative and influential riders, his unique perspective on things carried over into his work as a member of the bicycle industry…whether that was in promotion, product design or his efforts with the Sunday team. Jim’s championing of the ground-breaking Sunday Model-C and progressive 24″ riding are certainly two examples of that. Tweaking conventional cruiser geometry to create the Model-C was a bold move, and not without its detractors, but Jim’s vision of what a 24″ BMX could be ended up making a big impact on an area of BMX that was ready for a change. And Jim didn’t stop there. Jim actively promoted what was possible on a 24…whether that was in video edits, riding shots or clips of him riding a 24 in full-length videos (Up, Up and Away). While other companies introduced 24s into their lineups…they were often left to languish with little or no promotion and would later be dropped. The Model-C has been going strong since its inception. The introduction of the Sunday Wave-C was another major step in the 24″ world that Jim also helped make happen. A super high-end frame with wave tubing and long list of features, it quickly became one of the most popular 24″ frames on the market. Jim says he’s “off to new creative adventures.” If you look back on his riding career and his work at Sunday, I think you’ll agree he’s going to make a success of whatever he puts his mind to. Looking forward to hearing about what you get up to next. you have to take off early and pull out far enough to clear the bars. And just to keep things interesting, it narrows at the top and goes over-vert! It all the makings of a rad shot and for that it certainly delivered. 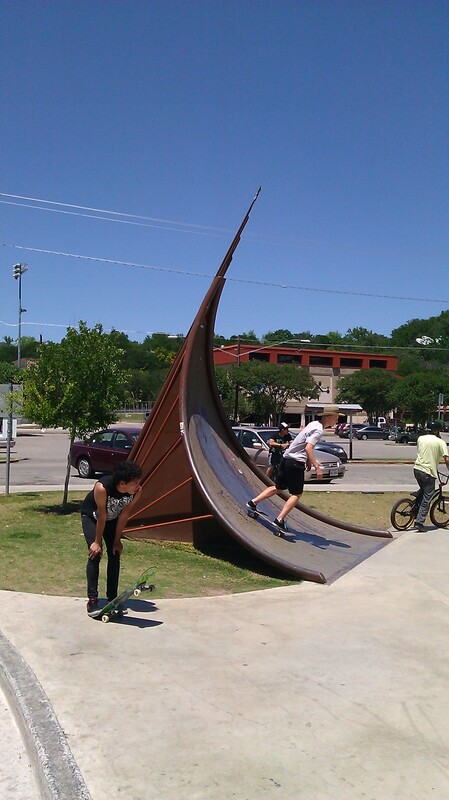 To give you a better understanding of how truly rad this shot is, I took a pic of this feature from an another angle during my trip to Austin last week. Looking at it from this angle, just makes it seem even sicker! Talk about a tight setup.